Without the protection of foliage to catch rainfall and slow the wind, and without roots to hold regolith in place, rain and wind can attack and erode the land surface of deserts and soil tends to be sparse. The result, as we have noted, is that hill slopes are typically bare, and plains can be covered with stony debris or drifting sand. In the desert, as in temperate climates, physical weathering happens primarily when joints (natural fractures) split rock into pieces. Joint-bounded blocks eventually break free of bedrock and tumble down slopes, fragmenting into smaller pieces as they fall. In temperate climates, thick soil develops and covers bedrock. In deserts, however, bedrock commonly remains exposed, forming rugged, rocky escarpments. Chemical weathering happens more slowly in deserts than in temperate or tropical climates, because less water is available to react with rock. Still, rain or dew provides enough moisture for some weathering to occur. This water seeps into rock and leaches (dissolves and carries away) calcite, quartz, and various salts. Leaching effectively rots the rock by transforming it into a poorly cemented aggregate. Over time, the rock will crumble and form a pile of unconsolidated sediment, susceptible to transport by water or wind. Although enough rain falls in deserts to leach chemicals out of sediment and rock, there is not enough rain to carry the chemicals away entirely. So they precipitate to form calcite and other minerals in regolith beneath the surface. The new minerals may bind clasts together to form a rock-like material called calcrete. 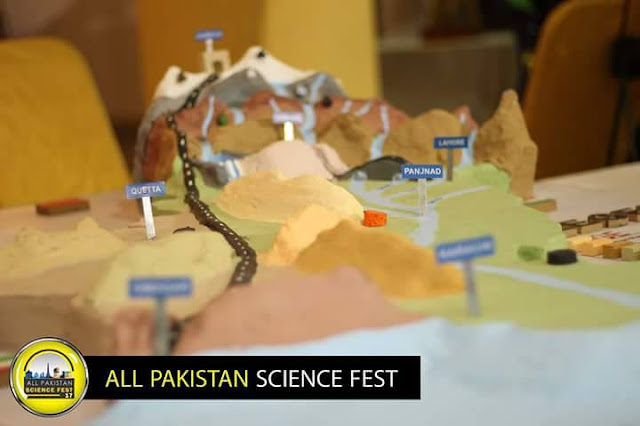 Soil formation and chemical weathering in deserts. Shiny desert varnish, a dark, rusty brown coating of iron oxide, manganese oxide, and clay, may cover the surface of rocks in deserts (figure above a). Desert varnish was once thought to form when water from rain or dew seeped into a rock, dissolved iron and magnesium ions, and carried the ions back to the surface of the rock by capillary action. More recent studies, however, suggest that desert varnish is not necessarily derived from the rock it coats. Instead, the iron and manganese in the varnish may come from dust that settles on the surface of the rock, for in the presence of moisture, micro-organisms (bacteria and archaea) can extract iron and manganese from the dust and transform it into oxide minerals. Such varnish won’t form in humid climates, because rain washes away the dust. Desert varnish takes a long time to form. In fact, the thickness of a desert varnish layer provides an approximate estimate of how long a rock has been exposed at the ground surface. In past centuries, Native Americans used desert-varnished rock as a medium for art: by chipping away the varnish to reveal the underlying lighter-coloured rock, they were able to create ﬁgures or symbols on a dark background. The resulting drawings are called petroglyphs. Because of the lack of plant cover in deserts, variations in bedrock and soil colour visually stand out. Slight variations in the concentration of iron, or in the degree of iron oxidation, in adjacent beds result in spectacular colour bands in rock layers and the thin soils derived from them. The Painted Desert of northern Arizona earned its name from the brilliant and varied hues of oxidized iron in the region’s shale bedrock (figure above b). Evidence of erosion by running water in deserts. Although rain rarely falls in deserts, when it does come, it can radically alter a landscape in a matter of minutes. 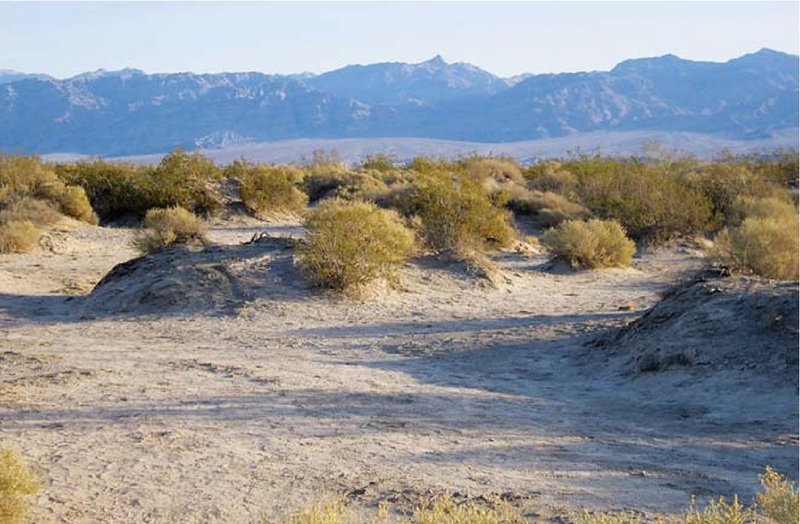 Since deserts lack plant cover, rainfall, sheet wash, and stream ﬂow are all extremely effective agents of erosion. It may seem surprising, but water generally causes more erosion than does the wind in most deserts (figure above a). Water erosion begins with the impacts of raindrops, which eject sediment from the ground into the air. On a hill, the ejected sediment lands downslope. The ground quickly becomes saturated with water during a heavy rain, so water starts ﬂowing across the surface, carrying the loose sediment with it. Within minutes after a heavy downpour begins, dry stream channels ﬁll with a turbulent mixture of water and sediment, which rushes downstream as a ﬂash ﬂood. When the rain stops, the water sinks into the stream bed’s gravel and disappears such streams are called intermittent, or ephemeral streams. Because of the relatively high viscosity of the water (owing to its load of suspended sediment) and the velocity and turbulence of the ﬂow, ﬂash ﬂoods in deserts cause intense erosion. Dry stream channels in desert regions of south-western North America are called dry washes, or arroyos, and in the Middle East and North Africa they are called wadis (figure above b). In temperate and humid regions, plant cover protects the ground surface from the wind, but in deserts, the wind has direct access to the ground. Wind, just like ﬂowing water, can carry sediment both as suspended load and as surface load. 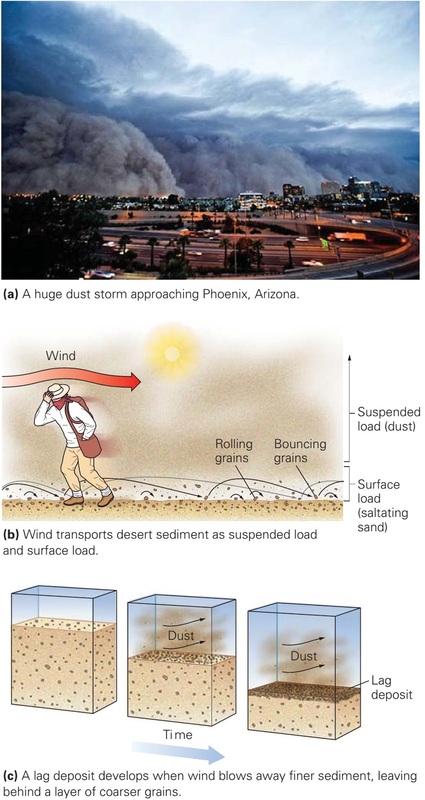 Sediment transport by wind in deserts. Suspended load (ﬁne-grained sediment such as dust and silt held in suspension) stays in the air for a long time and moves with it. The suspended sediment can be carried so high into the atmosphere (up to several kilometres above the Earth’s surface) and so far downwind (tens to thousands of kilometres) that it may move completely out of its source region. Particularly strong winds can generate a dramatic dust storm, or haboob, that can be 100 km long and 1.5 km high (figure above a). A dust storm, as it approaches, looks like a roiling, opaque wave. A particularly large one engulfed Phoenix, Arizona, in 2011, and shut down the airport. Dust storms are fairly common in the Sahara and Arabian Deserts, where they are known as haboobs. Surface loads, or bed loads, start moving only in moderate to strong winds, for such winds can roll and bounce sand grains along the ground, a process called saltation. Saltation begins when turbulence caused by wind shearing along the ground surface lifts sand grains. The grains move downwind, following an asymmetric, arch-like trajectory. Eventually, they return to the ground, where they strike other sand grains, causing the new grains to bounce up and drift or roll downwind. The collisions between sand grains make the grains rounded and frosted. Saltating grains generally rise no more than 0.5 m, but where sand bounces on bedrock the grains may rise 2 m.
The size of clasts that wind can carry depends on the wind velocity. Wind, therefore, does an effective job of sorting sediment, sending dust-sized particles skyward and sand-sized particles bouncing along the ground, while pebbles and larger grains remain behind. In some cases, wind carries away so much ﬁne sediment that pebbles and cobbles become concentrated at the ground surface (figure above b, c). An accumulation of coarser sediment left behind when ﬁne-grained sediment blows away is called a lag deposit. The progressive development of a ventifact. Just as sandblasting cleans the grime off the surface of a building, windblown sand and dust grind away at surfaces in the desert. Over long periods of time, such wind abrasion creates smooth faces, or facets, on pebbles, cobbles, and boulders. If a rock rolls or tips relative to the prevailing wind direction after it has been faceted on one side, or if the wind shifts direction, a new facet with a different orientation forms, and the two facets join at a sharp edge. 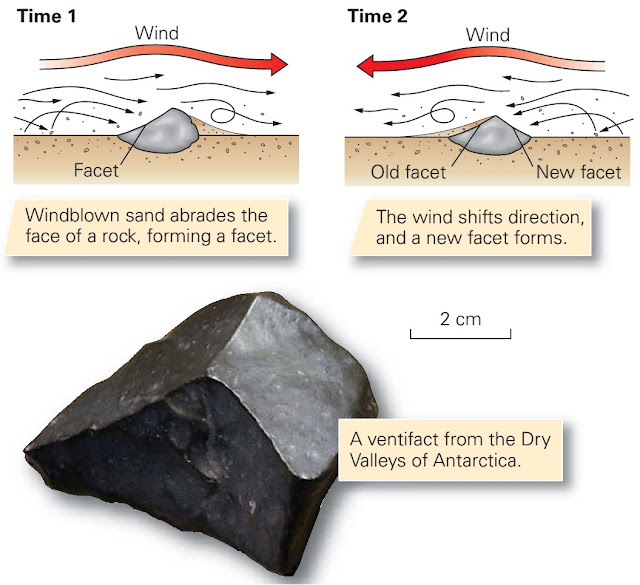 Rocks whose surface has been faceted by the wind are faceted rocks, or ventifacts (figure above). Wind abrasion also gradually polishes and bevels down irregularities on a desert pavement and polishes the surfaces of desert-varnished outcrops, giving them a reﬂective sheen. Wind erosion in Death valley has left bushes perched on mounds; roots keep soil from blowing away. Over time, in regions where the substrate consists of soft sediment, wind picks up and removes so much sediment that the land surface becomes lower. The process of lowering the land surface by wind erosion is called deﬂation. Shrubs can stabilize a small patch of sediment with their roots, so after deﬂation a forlorn shrub with its residual pedestal of soil stands isolated above a lowered ground surface (figure above). In some places, the shape of the land surface twists the wind into a turbulent vortex that causes enough deﬂation to scour a deep, bowl-like depression called a blowout.